Samuel J. Webb (1862-1909) was a businessman and prolific inventor from Minden, Louisiana. He invented more than 200 devices (for many of them he obtained patents), and the most popular of them was his cotton compress from 1880s, which was advertised and sold as the largest and most powerful compress in the world. The interesting for us invention of Webb is his keyboard one-column adding machine, patented in 1888 (US patent 392837). One-half of this patent (as well as of other patents of Webb) was assigned to Reuben Neil McKellar (1855-1933), one of the leading cotton manufacturers in the state and later mayor of Shreveport, LA. 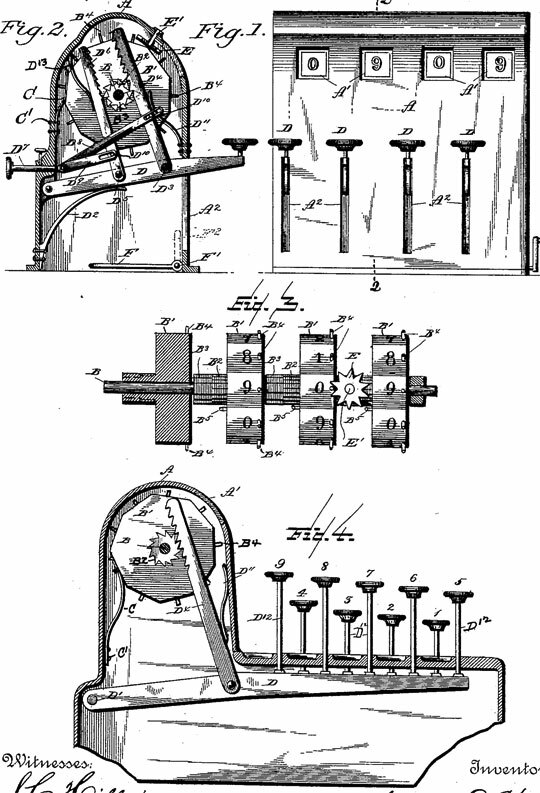 Let's examine the so called Adding and Subtracting Machine of Samuel Webb, using the drawing from US patent 392837 (see the below picture). Looking at the adding and subtracting machine of Samuel Webb, it is apparent that by four disks shown in the patent drawing, a total up to 9999 may be obtained. By a reference to Fig. 2 of the drawing, it will be seen that by pressing the push-rod D7 inwardly the rack-bar D4 is thrown out of operative position with its toothed collar B3, and the opposite rack-bar, D6, thrown into operative position with its toothed collar B2. The machine in this position is adapted for addition. Now, taking the parts as indicated, suppose, for example, it is desired to add two to the total, nine hundred and nine. By pressing upon the units key-lever so as to cause the disk D' to rotate backward two degrees the numeral 1 is brought to sight, thus making the total nine hundred and eleven. As the disk turns, the L-shaped pin B5 will come in contact with and cause the spur E to turn, which in turn, will throw or rotate the tens or adjacent disk one step in a forward direction, or contrary to the direction in which the units-disk is rotated, bringing the numeral 1 of the tens-disk to the panel and making the total read nine hundred and eleven. The machine can be used either for adding or subtracting by a simple manipulation of the push-rod D7; or, if desired, the operator may omit the rack-bar D6 and the shifting mechanism described, or vice versa, thus adapting the machine for subtraction or addition. Who was the inventor Samuel J. Webb? Samuel Jackson Webb was born on 3 September, 1862, in Homer, Louisiana. He was the first son of Dr. Stephen M. D. Webb (1826-1886), born in North Carolina, a distinguished and popular physician in this part of the state, and his wife Martha C. Jackson Webb (1839-1877), born in Alabama. The family had also: the girls Anna (born 1860), Mary (b. 1864), Carrie (1865-1963), Rosa (b. 1869), and the boy Robert Dickens (1867-1950). Stephen M. D. Webb was related to some of the most prominent families of North Carolina, Alabama and Miss. He was a nephew of the Dr. Robert Webb of Alabama, a first cousin of John Sharp Williams, a prominent American politician, and a cousin of Lucy Ware Webb Hayes, the wife of Rutherford B. Hayes, the 19th President of the United States. Samuel was educated in the local schools and always showed a creative mind and a knack for applying this creativity to practical inventions. In the late 1880s and early 1890s Webb spent much of his time after the invention of his famous steam powered cotton compress in the east, in Pennsylvania, overseeing the manufacture of the machines. By the mid-1890s, the business was a booming concern and Webb brought other family members into the firm to help its operation, including his brother Robert, who earned a medical degree in 1892. The Webb Press Company, chartered by the state of Louisiana in 1902, sold its devices to cotton producers in all parts of US and abroad. Then Webb had turned his interests to the new field of oil and gas production when he died suddenly on 6 April, 1909, in Minden, LA, of heart attack. Samuel Webb never married and left his business to his brother and partner Robert Dickens Webb.